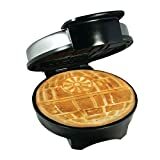 The infamous Death Star not only has the power to destroy a planet, it also has enough power left over to make tasty waffles for entire legions of StormTroopers and other assorted members of the Dark Side of the Force every single morning for breakfast, even while traveling in hyperspace. 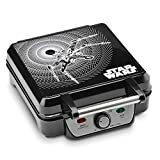 While not quite as powerful as the real thing, Earthlings stuck on this side of the galaxy can at least use this cool new Star Wars Death Star Waffle Maker to make fun Death Star shaped waffles for themselves. 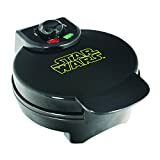 To use this fully armed and operational battle station / waffle maker, just pour batter onto the nonstick waffle plates, set one of five temperatures based on your browning preference, close the lid, and... voila!... 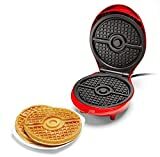 out pops a Death Star shaped waffle or pancake. Pouring syrup onto a SuperLaser or deep trench is so much more satisfying than ever pouring it into the typical boring old grid of dimples. 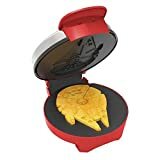 Best of all, it also can make eggs (I prefer intergalactic Mynock eggs over the Earth chicken variety), brownies, cakes, quesadillas, and it even doubles as a sandwich press. Hmm, can a miniature Frozen in Carbonite Food Saver small appliance be far behind at this point?